The country’s Halal Industry Development Corp (HDC), which launched the world’s first-of-its-kind Global Halal Support Centre (GHSC) yesterday, is considering setting up similar centres abroad. 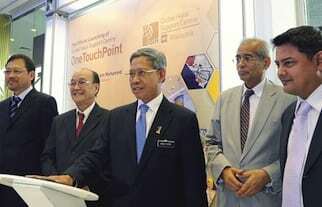 “We have already received requests from foreign countries to set up a similar facility in their country,” HDC chief executive officer Datuk Seri Jamil Bidin told reporters after the launch of GHSC by the Minister of International Trade and Industry Datuk Seri Mustapa Mohamed in Bandar Utama, Petaling Jaya. The Malaysian GHSC, costing RM2 million to build and develop, is a one-stop centre for functional services in support of the halal industry in line with the country’s aspiration to become the global halal hub. In a press statement, HDC said the centre offers wideranging services, including application processing and advisory, conference and exhibition, well-stocked Halal Knowledge Centre (HKC) and various channels of information dissemination on the halal concept — including a modern compendium of halal. Knowledge broadcasting services via cutting-edge technology such as mobile applications, i-Kiosk, widget, B2B (business-to-business ) portal, social media networking and “VIP meet & greet” services. “An essential arm of the GHSC, the HKC houses the library, a huge resource of more than 6,500 reference materials, including books, reports, journals, newspaper clippings and research papers,” said the centre. At the launch, GHSC also unveiled its new portal, an online medium which stores more than 700,000 database and market intelligence information covering topics and subjects such as food, agriculture, pharmaceuticals and cosmetics.